Product Description: Bull Built-In Propane Gas Searing Station W/ Stainless Steel Lid - 94008. Upgrade your outdoor kitchen with this searing station from Bull. This propane gas searing station slides into your BBQ island, and provides the perfect match to your Bull grill. 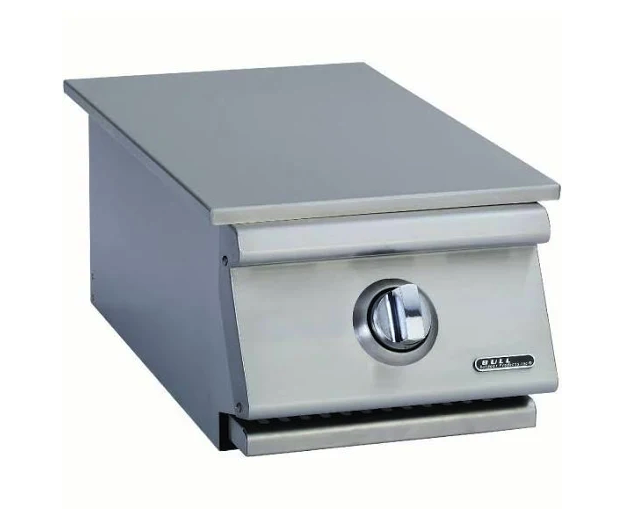 The 94008 searing station features 304 stainless steel construction which combats outdoor wear and tear, and the low profile stainless steel cover helps to extend the life of your searing station. With the easy to use push-to-light ignition system, you will be searing in no time. The high-quality ceramic burner distributes 25,000 BTUs of heating power across the stainless steel cooking grates to help sear your food for a restaurant quality steak. The Bull 94008 searing station features a high temperature setting for searing thick cuts of meat such as pork chops and a low temperature setting for searing delicate food such as fish. The Bull 94008 built-in propane gas searing station is the ideal choice when choosing an addition to your outdoor grilling space!